Calling the Press Conference: Edward Lozzi briefs Los Angeles Mayor Elect Antonio Villiaragosa and City Councilman Eric Garcetti at a Joint Press Conference in early 2005 with Los Angeles County Sheriff Lee Baca (not shown) for the endorsement of Sheriff Baca and Villiagarosa's controversial 1/2-cent sales tax ballot initiative to finance 6,000 new needed police officers for the city. Edward Lozzi, Sandra Bartley (left), Thomas Murphy. Background: Brian Cowan, Pamela Moskovitz. LMS News Wire Service: Distribution of your press release to thousands of media outlets nationwide. Thank you for all the hard work you put in. ... the Sheriff was ecstatic and very pleased. I wanted to acknowledge the work that you did and how much it is appreciated. Your lectures are great ... we never had a guest speaker quite like you who literally came right out of the trenches and told us how things are in reality in the independent world of Public Relations. On behalf of MTV News, I would like to thank you for allowing us to attend your Oscar party. Your cooperation is greatly appreciated ... it's been wonderful working with you. 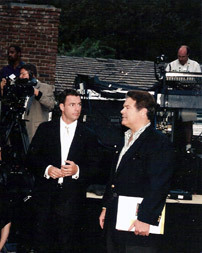 Edward Lozzi, coordinating the Entertainment Tonight crew with anchor Mark Steines at the Hollywood Farewell Concert to President & Mrs. Clinton in August of 2000. 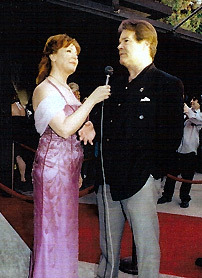 Edward Lozzi & Associates, former White House Press Advance Office, was chosen to coordinate the hundreds of media credential requests for this historical event which included John Travolta, Cher, Sugar Ray, Diana Ross, Brad Pitt and Jennifer Aniston, Gregory Peck, Jesse Jackson, Liz Smith, Cindy Adams, Army Archerd, Jimmy Smitts, Shirley McClaine, Barbara Streisand, Governor Gray Davis and over a hundred more stars and government officials. The entire White House staff and press corps was brought in and coordinated by Edward Lozzi & Associates. Click here to view this private one-hour special. Another year, and yet again you did a fabulous job of rounding up all the press. All the celebrities were stunned by the power of the press line. Let's start gettung ready for 2008. All the best - always. I so admire your loyalty to (the late) Lana Clarkson ... It was great seeing you and I look forward to seeing you soon. Thank you for the great year in the media. My Friars Club tribute, the New York Times Honda project, the Barris Car Show in Culver City, the national Hot Wheels Batmobile tour, the Paris Hilton hot rod photo shoot ... the list goes on and on. Excellent job. Your hard work, including all of the press releases, the last minute press conference, your written speech for me ... the Reagan appearence ... I know what hardships you were working under but you pulled it off ...thanks again for a job well done. 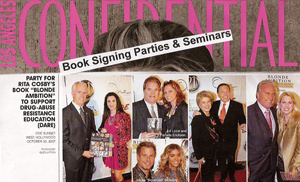 Thank you for all of the tremendous help you gave me and INSIDE EDITION ... Your assistance with stories for our program is always welcomed. I just wanted to drop you a note to ... thank you for your high degree of professionalism ... both at Los Angeles Magazine and at Time Magazine ... you're a pro. LMS (Lozzi Media Services) - LMS Newswire reaches thousands of media outlets nationwide including local TV news desks, event calendar listing editors, feature writers for the Nations top 20 Newspapers including The Los Angeles Times, The Daily News, Los Angeles Business Journal, City News Service Wire, PRWeb wire, Vogue, W, Apparel News, Fashion Institute, AP, UPI, Copley News Service. Knight-Ridder News Wire, The New York Times, The Washington Post, Variety, Hollywood Reporter, Los Angeles Magazine, LA Confidential Magazine, Angeleno Magazine, LA Weekly, City Beat, Court TV, CNN, FOX News Channel. 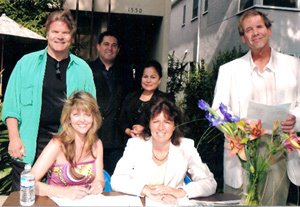 all accredited freelance writers in lifestyle/entertainmnet and politics, KFWB News Radio, KNX News Radio, CBS Radio Network, Howard Stern Show, Drudge Report, Al Franken, Rush Limbaugh, US News & World Report, The Wall Street Journal, Entertainment Television, Access Hollywood, Entertainment Tonight, Rolling Stone Magazine, The Beverly Hills Courier, The Long Beach Press Telegram, USA Today, ThebNew York Post, Cindy Adams, Liz Smith, Beverly Hills 213, Bill O'Reilly, Michael Moore, The NY Daily News, The Dallas Morning News, Las Vegas Magazine, Venice Magazine, and many other thousands of media outlets including all national and local TV talk shows. LMS is also distributed to VIPs in public relations, film/tv producers, law firms, screen writers, film reviewers, medical and health writers, agents, managers, and thousands of successful movers and shakers in the arts, government, industry, publishing, and medicine. This fee-based service is an option to investing in a complete public relations campaign. LMS sends your press release with your contact phone numbers and e-mail/web site addresses attached to all of our important e-mail addresses immediately or at any time you designate. Editing of your press release is included. Please limit to 400 to 500 words. Flat fee. Call 310-922-1200 or e-mail for further information. Edward Lozzi & Associates also offers concept development, as well as product promotion and motion picture product placement.